We were playing around Google Cloud SQL and wanted to see if we can migrate some of our MySQL database data onto the cloud. We opted to use Pentaho Data Integration (aka Kettle) to do some ETL. We were surprised to see that Kettle could not connect properly to Google Cloud SQL (even if Google says it's running MySQL 5.5). So, we had to dig deeper. Here's what we found out. Using a MySQL connection type does not allow a custom URL. It was prefixing the URL with "jdbc:mysql://". We needed to use a URL that starts with "jdbc:google:rdbms://". 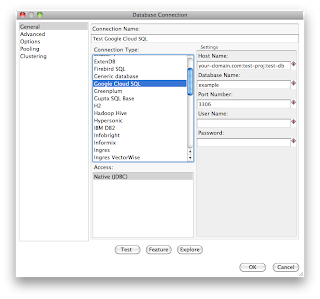 Using a "Generic database" connection type allows Kettle to connect successfully. But it still fails in retrieving meta information about tables/columns/datatypes. Kettle optimizes by using meta data from a JDBC prepared statement (not from the result set). Unfortunately, calling PreparedStatement.getMetaData on Google Cloud SQL JDBC driver always returns null (even after the statement is executed). This prevents Kettle from proceeding to display the table in its UI. To solve the above problems, we decided to create our own database plugin. For more information on developing your own Kettle database plugin go to creating database plugins at Pentaho InfoCenter. 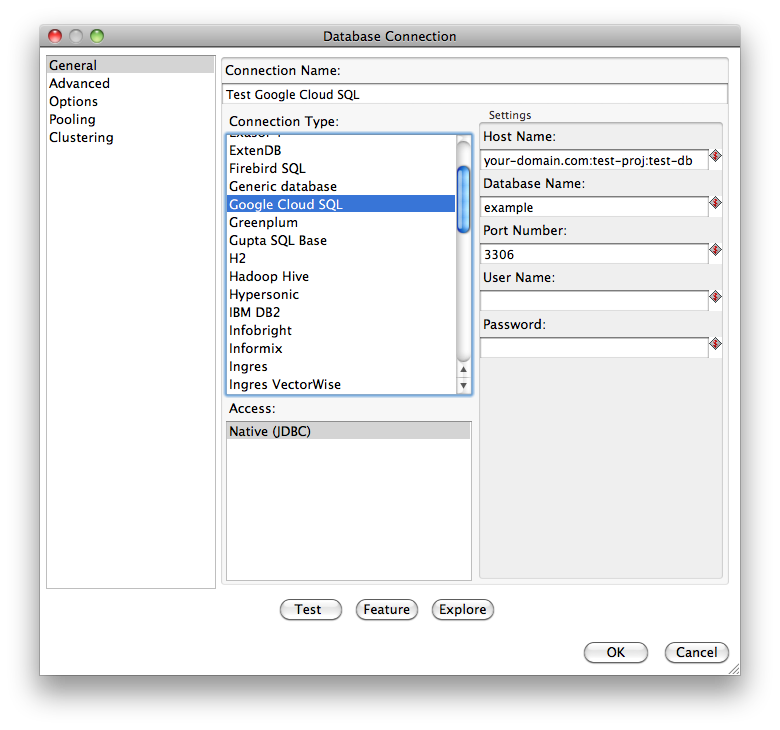 To create a database plugin for Kettle, we need to implement the DatabaseInterface. Here's what we did. We extended from the original MySQLDatabaseMeta class to get the default behavior of a MySQL connection type. Then we override a couple of methods to achieve behavior that is specific to Google Cloud SQL. We had to specify a URL that starts with "jdbc:google:rdbms", and com.google.cloud.sql.Driver as the driver class. * support metadata retrieval with prepared statements. * with the Google Cloud SQL driver. Thus, this is turned off. Because of the above, the Google Cloud SQL driver throws an exception. We had to disable the setting of fetch size. This was tested on version 4.4 of Kettle. The resulting JAR file is copied to the plugins/databases folder of your Kettle installation (e.g. /Applications/pentaho/design-tools/data-integration). The JDBC driver from Google Cloud SQL can be downloaded from http://dl.google.com/cloudsql/tools/google_sql_tool.zip, or if you already have the App Engine SDK for Java (90+ MB) (look for the google_sql.jar file under the lib/impl folder). Copy the driver to the libext/JDBC folder of your Kettle installation. After deploying, restart Spoon (the GUI) and you should be able to see the "Google Cloud SQL" connection type. Thanks to Karl Benavidez, Jose Araneta, and the awesome developers at Orange and Bronze Software Labs for making this possible.